Ribbon Rice | Simple and Delicious ! Do you feel guilty about taking much non vegetarian food? 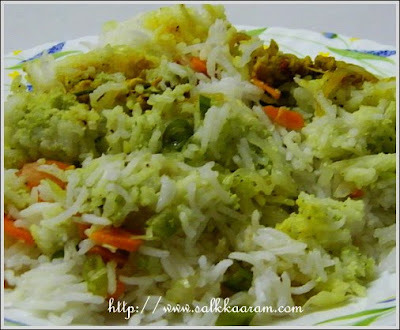 Then ribbon rice is a good choice for you, a biryani like meat mixture to satisfy your desire to take non, a delicious garlic-ginger added chutney to reduce your cholestrol levels, a simple vegetable mixture to quench the flames of your guilt.This rice is made with three layers, one with meat, one mixed with chutney and last one is with some veggies. Since the three main characters here do not love more-spicy things, I have been compelled to reduce the use of chilly.Make your own meat/veg mixtures and chutney and experiment! Heat a heavy bottomed vessel. Put ghee, when it melts, add spices. Stir for few seconds, pour water. Add salt, allow to boil. Then add washed rice, cook until the rice is done. Please refer the ghee rice recipe for this. Cook meat with salt and turmeric. Heat a pan, add little ghee, saute onion until transparent. Saute garlic and ginger paste. Add tomato, all the powders except turmeric, and the leaves. Stir until the tomato is cooked and mashed, add cooked meat into it. Grind together, add lemon juice. Mix well , keep it aside. Chop carrot into thin pieces. Heat little ghee, saute all these veggies. Add salt, sprinkle little water over this. Keep covered, cook on a low flame, stirring occasionally. Again, heat the heavy bottomed vessel. Grease it with ghee in the bottom. Divide the cooked rice into three equal parts. Put one part in the vessel. Spread meat masala over it. 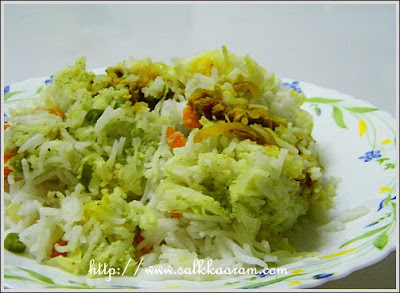 Mix one part rice with the green chutney. Then spread it over meat masala. Above it, spread vegetable mixture. Then put remaining rice above it. Cover the vessel using the lid, tightly. Cook for 10 minutes on a very low flame, like we do for biryani. Check the steam has come out after 10 minutes, if not let it cook for some more minutes. Beautiful!! I love this recipe of yours! Seena, love this idea, sounds really good. Will sure try it out. So just serve as such from the layers without mixing it up totally huh? (used to visit you as "Zaara") Ooohh...this looks so good - what a complete meal. I'm definitely going to try this out! This is my kind of food it look very delicious! I like all of the flavours it will be so aromatic and tasty. This is really a good alternative to meaty biryanis. Looks really delicious! Looks great! I should try it one day.